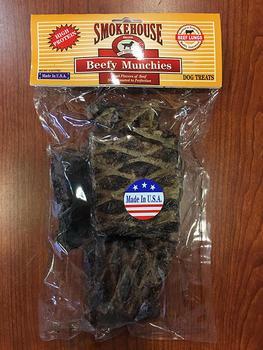 Smokehouse Pet Products of Sun Valley, Calif., is recalling dog treats labeled as Beefy Munchies. The the recalled product, which comes in a 4-oz bags marked with UPC 78565857957 and lot 449294 and a best used by date of 10/25/19 stamped on the back, was shipped to sold in Washington, Michigan, North Carolina and Colorado through distributors selling to various retailers. Customers who purchased the recalled product should discontinue its use and may return the unused portion to the place of purchase for a full refund. Consumers with questions may contact Smokehouse Pet Products at 1-877-699-7387, Monday through Friday, 7am-3:30pm (PST).